Last months topic pertained to dental implants and what you can do to ensure your dental restorations serve you for the longest time. Yet even with our best efforts a few implants will develop bone and soft tissue problems. This month I will discuss treatment options for the problems that can arise. Dental implant infections can happen but are not common. The good news is rarely do these infections cause significant symptoms. The other good news is just because you have bone loss on an implant does not mean it must be removed. If the implant is stable and functional it can remain in place as long as the infection can be controlled. However the minimal symptoms associated with these infections often permit patients to ignore the problem until there is a substantial amount of bone loss. If there is only inflammation in the gum tissue with minimal one loss, nonsurgical approaches alone or in conjunction with topical antibiotics can often address the problem. More commonly there is significant bone loss present around the implant. These situations will require some form of surgery to remove foreign material, clean and decontaminate the surface of the implant. Placing graft materials and/or growth factors to regenerate bone support is often included in these procedures. While effective, conventional surgery carries significant downsides such as post treatment pain and significant gum tissue recession. While recession may not be an issue for implants in the molar areas that are not visible, it can be disastrous for implants in the front. In areas where post surgical recession of the gum tissue cannot be tolerated surgery can be done with a Laser, which can preserve the gum tissue in most cases. Laser based therapy, according to patient feedback, is significantly less painful and conventional surgical approaches. Fortunately, more than 90 percent of dental implants will never experience bone loss problems. Keeping you implants clean and having the bite checked periodically to protect from overload are the most important aspects of maintaining these type of restorations. If problems arise early treatment is always best. 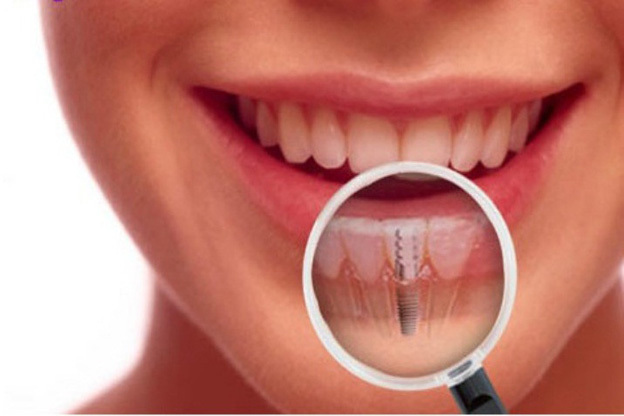 If the problem have progressed beyond the early stages fortunately there are good treatment options that can repair and maintain your implant restorations.